Discover rugged mountain scenery, dramatic desert forts and welcoming Bedouin culture on this superb walking and trekking holiday. What made this holiday special was being with our 5 Omani guys. Their hospitality, humour and meeting their families all gave us a far better insight to Omani life than we could get with a European Leader. Our guide was excellent, the whole trip hinged on him and his trek staff who did us proud. Excellent knowledge and interesting. Hard working and very good company. Quality of information, efficiency of service provided all excellent. Good value for money and an excellent holiday all round. Oman is a wonderfully laid back and hospitable place with friendly people, a lovely coastline, wild mountains and superb opportunities for walking. A visit to this fascinating country will leave you with many unforgettable images: wide landscapes of rugged mountains and gorges stretching into the distance; ancient mountain villages clinging to cliff sides or nestling in remote and spectacular wadis; lush oases of swaying date palms fed by ancient irrigation canals; and Bedouin tribesmen leading their camels over desert dunes. These landscapes are dominated by many impressive sand coloured forts and smaller watch towers - evidence of Oman’s warlike past. There will be other less dramatic images too: the unfailingly friendly welcome of the people and the courteous traditional offering to visitors of Arabic coffee and dates whether in mountain village or simple Bedouin tent, amazing star filled skies, palm fringed pools in deep canyons and the peace and tranquillity of wild and remote mountains with just the sound of the wind for company. Oman is the oldest independent state in the Arab world and is one of the more traditional countries in the Gulf region. At one time Oman had its own empire, which at its peak in the 19th century stretched down the east African coast with its capital in Zanzibar, and vied with Portugal and Britain for influence in the Gulf and Indian Ocean. The country was famous for its seafaring prowess with dhows trading with Africa and India and beyond – Sinbad the Sailor is said to have come from Oman. Nowadays although opening up to tourism Oman is doing so with sensitivity and imagination. Omani people value their culture and history and are working to preserve it. At the same time Oman is the most laid back of the Gulf States. While preserving their Islamic traditions Omanis are tolerant and friendly and welcome tourists to their country especially those who appreciate their country and its traditions and respect its Islamic culture. 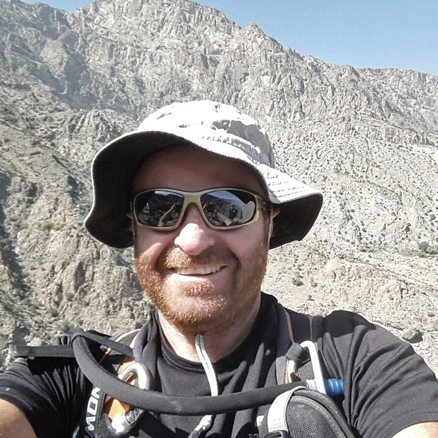 The mountains of Oman are very rugged and the trekking, while not overly strenuous, is graded moderate because the going can be very rough underfoot. The predominant rock is limestone and while some trails are way-marked, paths may not be well defined and will often be over loose scree, rocks and limestone pavement with occasional steep ascents and descents. The going can be a little unforgiving with sharp rocks and prickly thorn bushes! Occasionally paths are somewhat ‘airy’, which while giving tremendous views over dramatic canyons or gorges, may not be suitable for sufferers from vertigo! The mountains of Oman offer a dramatic landscape cut by the most spectacular gorges and canyons. Hilltops are crowned by imposing forts and picturesque traditional villages cling to hillsides. We will take day walks through this fabulous scenery and enjoy refreshing dips in lush wadis that offer relief form the desrt sun. We’ll walk across the impressive sand dunes of the Wahiba Sands, explore abandoned villages and gaze into the depths of Oman’s own Grand Cayon. Along with our walks we’ll enjoy vists to the ancient fort and bustling souk of Nizwa, see the sights of Muscat and finally relax with a romantic trip on a dhow. Meal arrangements: Bed and breakfast in Muscat. All meals included elsewhere. Fly to Muscat. Walk to Muttrah and visit the souk. Walk in Wadi Bani Khalid. Stay overnight at a Bedouin encampment in the Wahiba Sands. Walk through dunes. Drive to Nizwa to explore the fort and souk. Visit Bahla & drive to Jebel Shams. Trek to the abandoned village of Ab Sab. Drive to Misfah. Drive to Sharaf al Alamayn and walk back to Misfah. Sightseeing tour of Muscat including the Grand Mosque. Trip on a traditional dhow. Throughout the tour you will be accompanied by a professionally trained English-speaking guide, who will have a large fund of knowledge regarding the history and culture of the country. Depart London for the flight to Muscat, capital of Oman. Day 2 - Arrive Muscat. Group transfer to hotel. Morning at leisure. Afternoon walk from Riyam to Muttrah - 2 hours. Arrive early morning in Muscat and after getting your visa and passing through immigration, transfer to your hotel. Check into your room and rest for a few hours to recover from the flight. Your hotel has a swimming pool and terrace where you may relax. Muscat is a clean, well maintained and prosperous City. Its modern white buildings are attractive and relatively low rise in contrast to those in many cities of the Gulf region and the city is green and flowery - date palms, grass lawns and bougainvillea line the main roads providing a welcome contrast to the dun coloured, rocky crags that reach right down into the centre of the town. The city itself stretches in a long ribbon along the mainly north facing coast and orientation can be confusing. The International Airport lies to the west and the old city and port and the commercial centre of Ruwi are east of the airport. Newer suburbs lie further east, so distances between various parts of the city can be quite long, but roads are good and travel is quick and easy. Today, you will probably be tired after your flight, so rather than rush you out to do sightseeing on your first morning (the Grand Mosque is only open till 11am) we have saved your main sightseeing until you return to Muscat. Instead, after lunch you will drive down to the area known as Riyam to do a very pretty walk from there, following an old trail over the hill to Muttrah. You climb 150 metres on steps to a fantastic viewpoint over the coast and sea. As you climb, you will see behind you, a white monument on the hill depicting an incense burner, reflecting the importance of frankincense in Oman's history. Reaching the top and admiring the views, you then descend into a wadi to an abandoned settlement where you can see the remains of houses and fields and falaj - the old irrigation system. The villagers planted trees, some of which still remain, to attract honey bees. You then descend an ill defined path down a very pretty wadi, following beside the waters of a small stream - watch your feet here as the rocks can get slippery. It seems so isolated and quiet that you can hardly believe that you are in the middle of a large city! Finally, you make a short climb out of the wadi before descending past a cemetery to walk the short distance into Muttrah. Turn left and you arrive at the harbour with its bobbing dhows and then come to famous Muttrah Souk. Before exploring the souk you might like to stop at one of the small cafes in front of the souk for a delicious fruit juice cocktail. By the time you arrive Muttrah Souk, the oldest in Oman, will be coming alive for the evening. The souk is a labyrinth of stalls and shops selling everything from brass lions, ceramics, ready made clothes and silk to dried fruit and nuts. The aroma of spices and incense fills the air. You can even find frankincense for sale - this has long been one of Oman's most famous exports. The souk is a very lively and busy place and a little gentle haggling is expected, although in any case goods here are not expensive. You will then meet your transport to return to your hotel. You may choose to either eat at the hotel, or take a taxi to one of Muscat's many excellent restaurants. Day 3 - Drive to Wadi Ash Shab. Drive to Kadbah, 2,000m/6,562ft. Leaving Muscat, you drive south to Wadi ab Shab. Before Cyclone Gonu hit in 2007, this was one of the jewels of Oman, but many of its former plantations and irrigated terraces were damaged by the flood waters that surged down from the mountains above. Even so, it is still a place of great peace and natural beauty and the authorities have worked to restore it to its former glory. Trying to ignore the flyover for the coastal road at the mouth of the wadi, it is a beautiful walk up through the irrigated fields still remaining and beside various beautiful blue pools, to the head of the gorge. Here, a feature of this day's activities is to swim through several pools and then through the blue waters of an extremely narrow gorge (hardly shoulder width) to duck into a peaceful cavern fed by two waterfalls. With its bright blue waters dramatically lit from above this is a very special and peaceful place. Returning on foot to the road you then drive up nearby Wadi Tiwi, another green and beautiful wadi where waters flow throughout the year and where mangos, bananas and figs as well as the ubiquitous date palms are grown. If you feel like a leg stretch you can walk back down Wadi Tiwi past the various mosques and houses of the villages in the wadi. Once back at the vehicles you will continue along the coastal road, keeping your eyes peeled for gazelle that hide under the acacia bushes on the coastal plain. You will spend some time in Sur, a traditional fishing town and historical port. It is also home to the last surviving dhow factory that now mostly builds boats commissioned by other Gulf State sheikhs. You will then head inland, skirting the base of the mountains to reach one of the entrances to Wadi bani Khalid. Day 4 - Mountain walk in Wadi Bani Khalid, 1,000m/3,281ft - 4 hours. Drive to Bedouin encampment. Today you will have a very interesting and varied walk in Wadi Bani Khalid, deep in the Oman mountains and one of the largest and most picturesque wadis in Oman. It has a large enough rain drainage basin that there is water in parts of the wadi all year round. Each year the rocks and boulders are moved by the force of the water after a storm and so each trek in the wadi is slightly different. Although the way may be waymarked this is a rocky mountain walk with some steep sections. As is usual in these mountains the path may be uneven and the going is stone underfoot. There may be some bouldering as well as sections where swimming (or at least floating) are required. Having started early from near the entrance, it is unlikely you will encounter any other walkers or trekkers today. Towards the end of your walk you will cross a ridge and will see far below the welcome greenery of Wadi Bani Kahlid oasis, one of Oman's most beautiful wadis. You will meet your transport and drive north-west along the edge of the Sands to the small town of Al Wasil. From here you will turn off into the desert to reach an encampment among the dunes. Accommodation at the Desert Camp will be in simple Bedouin huts with shared showers and toilets. Meals will be taken Bedouin style, sitting on cushions and you will be able to relax in the shady sitting area, or in the evening around a campfire under the stars. This is a very friendly place, full of Bedouin character. In the spirit of Arab hospitality you will be offered local dates and kahwa - Omani black coffee, flavoured with cardamom and served in tiny cups. Such hospitality is very much a feature of a visit to Oman. Normally any visit starts with coffee and dates being offered and it is considered bad manners to refuse - even a souvenir seller may well offer you such hospitality before getting down to the business of selling you something. The Wahiba Sands have been described as a 'perfect specimen of a sand sea'. Although fairly small in size, stretching just 180km from north to south and 80km from east to west, this is a true dramatic rolling-sand desert with dunes reaching 150m high. The dunes vary in colour from deep red to a rich honey colour and stretch as far as the eye can see, flowing in corridors from north to south. The Wahiba Sands are considered important because they contain such varied terrain within a small area and in 1986 the Royal Geographical Society made an expedition to the Sands discovering a surprising number of plants, mammals, birds and other wildlife there. They are also the traditional home of the nomadic Bedouin and their animals. Day 5 - Morning walk through dunes. Drive to Nizwa. You will have probably awakened to find that the dunes are swathed in dense mist. The rich variety of life in the Wahiba Sands is sustained by these heavy overnight mists. The mist will soon burn off though once the sun rises. In the morning it is fascinating to see evidence of a wide variety of life which exists here. You will see myriad tracks of camels, small mice, dung beetles, snakes and birds criss-crossing what you might at first sight have taken to be a sterile landscape. As you walk through the dunes, your Bedouin guide will be able to identify all these tracks for you even down to those made by a scorpion. You will see various Bedouin camps along the way and may have the opportunity to visit one - these Bedouin camps are temporary encampments with shelters for camels and other livestock such as cows, goats, chickens and sheep set round about a central living area. The camps although simple are surprisingly comfortable and might have such 'mod cons' as a generator to power electric light and television and also, as in so much of Oman, the ubiquitous satellite dish. There may also be a 4WD parked beside the camp. Bedouin children will probably try to sell you handmade woven items such as bracelets and key-ring tassels made from sheep or goats' wool. These are a way for Bedouin families to make a little additional income and are not expensive and make nice souvenirs. You will walk back to 'the desert camp' by a different route through the dunes in time for a late lunch. It may be possible to rent a camel at the camp to ride into the dunes instead of walking - this will be payable locally. After lunch you will leave the desert and head north-west to the town of Ibra (famous for its women's only market on a Wednesday) and continue to Nizwa. This is a verdant oasis city surrounded by date plantations, with over 40 varieties of date said to be grown in the area. The Falaj Daris bringing water to the city and sustaining its fertility is the largest falaj in the country. The city sits at the foot of the Hajar mountains at an important crossroads leading north to Muscat and south to Dhofar and is considered the cultural capital of Oman. Day 6 - Morning visit to Nizwa fort and souk. Visit Bahla pottery village. Drive to Jebel Shams, 1,950m/6,397ft. This morning you will visit Nizwa fort and the souk. Nizwa was the capital of Oman for many centuries and today the city is still dominated by its sand coloured fort and souk. The fort, completed in 1688, has rounded, robust walls designed to withstand mortar fire and its most striking feature is the massive central tower, a colossal round tower soaring 35m above the rest of the fortification and all but impregnable. The fort is veritable maze of rooms, high-ceilinged halls, doorways, terraces, narrow staircases and corridors, with battlements, turrets, secret shafts, false doors and wells. The nearby Nizwa Souk is an important commercial market with lots of noise and haggling. It is separated into different selling foodstuffs, animals, fruit and vegetables, meat and fish. The souk was renovated in the 1990s and although the areas selling handicrafts may seem rather sanitised, the airy fruit and vegetable market is impressive and the whole area has many fascinating hidden corners. You then drive to the Jabal Shams Mountains. Before starting the drive up to the mountain top there should be time to visit the abandoned village of Ghul. This village, whose name has the same origin as the English word 'ghoul', evidently had a reputation for its evil djinns and witches and remains even today a very atmospheric place. It is worth crossing the falaj at the bottom of the village and climbing up through the old streets to explore the deserted houses of the upper village. There is an old watch tower, many old houses and some interesting rock carvings in the main street. Travelling on into the mountains, you eventually arrive at a plateau and will come across the western edge of the Wadi An Nakhar, Oman's 'Grand Canyon'. The panoramic views over the gorge from this edge are tremendously impressive with the floor of the gorge visible some 1,500m/4,922ft below you and the pollution free night sky offers fantastic star gazing. Day 7 - Return walk from Khitaym to the abandoned village of Ab Sab - 4 hours. Drive to Misfah. After breakfast, you will make the short drive to the small settlement of al Khitaym, 1,900m/6,233ft. Known as the Balcony Path this is probably the most famous hike in the country, winding around the cliffs halfway up the rim of Wadi Nakhr to the abandoned village of As Sab. The scenery here is some of the most dramatic anywhere in Oman, the canyon forming a kind of huge natural amphitheatre, with kilometre-high cliffs and far below you the village of Nakhr can be seen in the depths of the canyon. The walk to the houses of the abandoned village of As Sab takes around an hour and a half. Formerly called Sab Ban Khamis it was home to 15 families who lived a self-sufficient and relatively prosperous life here. The houses are sturdily built of stone and you will even find an old flour grinder between two of the houses. There is an old watch tower at the edge of the village. The village was finally abandoned when the villagers moved out of the gorge to an easier life in villages with access to roads and electricity. Formerly, the village was irrigated by a falaj whose waters originated in a cave in the cliffs high above and led down to a pool and were then diverted to fertile terraces where a wide variety of crops such as watermelons, pomegranates, tomatoes, chillies and wheat were cultivated. These terraces now sadly lie dry and abandoned and no goats or sheep graze round the village. This walk requires a reasonable head for heights, although the path is around a metre wide and is not on the edge of the precipice. It is rocky in places but not technical. If you find it too hard there are shady benches along the path where you could wait for the rest of the group to return if need be. After a picnic lunch, you will return along the balcony path to your vehicles and drive to the enchanting village of Misfah. Misfah al Abriyyin is the ultimate 'medieval' village, well-watered by its own falaj system and surrounded by fertile, irrigated gardens of corn, dates, oranges and lemons. Its narrow streets and attractive old traditional houses cling to the crag and it is overlooked by its own stone watchtower. Many of the inhabitants of the old village have nowadays decamped across the valley to the new village built in a rather more convenient situation where there is space to build more modern houses large enough to house entire extended families. However the old village has been saved from the decline which has struck so many similar places by the fact that it has been adopted for preservation by the Oman Ministry of Tourism, which has already bought and renovated several houses. Happily it seems that this beautiful village will be preserved for future generations. Your accommodation tonight is in a converted traditional house. Day 8 - Mountain trek from Sharaf al Alamayn, 2,050m/6,726ft, to Misfah - 7 hours. Drive to Muscat. From Misfah you will drive through the town of al Hamra with its many fine old houses and take a dirt road 25km up into the mountains. After a drive of about 30 minutes you arrive at the ridge top at Sharaf al Alamayn where you will start your walk. The views from here over the Western Hajar Mountains are just stupendous. Looking down you can see several villages far below you, including the picturesque village of Balat Sayt and smaller Hat and beyond is the spectacular gorge of Wadi Bani Awf, one of the largest wadis in Oman. This is a stunning and remote place although it may be a little cool and breezy - one of the few times in Oman when you may break out your fleece. From Sharaf al Alamayn you follow the airy ridge top enjoying tremendous views over the mountains and wadis on the northern side of the Western Hajar Mountains, especially spectacular Wadi Bani Awf. The route is way-marked with paint flashes but in places the path will be rocky and rough underfoot. After a couple of hours you will see where the challenging route up the cliffs from the village of Balad Sayt joins from the right. From this point you will be on a more established and maintained donkey trail all the way to Misfah. You descend past a Bedouin encampment at Hayl al Jawari and then descend more steeply in a gorge all the way back to the picturesque village of Misfah. Here you will re-join your vehicle for the return drive to Muscat. Day 9 - Morning sightseeing. Afternoon dhow trip. In the morning, you will have a sightseeing tour of Muscat. First you will visit the Grand Mosque. The mosque, completed in 2001, is an extraordinary building, borrowing architectural features and decoration from Arabia, Persia, Afghanistan and Central Asia. The elegant simplicity of the exterior archways, decorated arcades and courtyards contrasts with the magnificence of the elaborately decorated interiors. A mere description of the features of the main prayer hall which can accommodate almost 7,000 worshippers, the huge Swarovski chandelier, said to be the largest in the world and the huge Persian carpet which covers the floor, does not do justice to this wonderful example of modern Islamic architecture, which is at once serene and spectacular. (See Trip Dossier for how to dress to visit the mosque). You will then travel to see Muscat Old Town. The position of the old town was chosen for its harbour and natural defences. The town was so well protected by the craggy mountains that surrounded it that prior to 1929 it was accessible only by footpaths over the hills, or from the sea. The old town walls can still be seen and two old Portuguese forts, Jabalai and Murani, still dominate the town. In 1972, the Sultan's rather quirky al Alam Palace was built on the waterfront and more recently a complex of elegant new government buildings has been constructed which create an attractive modern centre to the old town where it is very pleasant to wander. The afternoon is spent aboard a traditional dhow and will take in the sunset. Dhows are marked out by their triangular sails and have been plying the seas around the Persian Gulf for centuries, transporting dates and fish. Day 10 - Group transfer to airport. Fly to London. Today you will be transferred to the airport for your flight back to the UK. The trip was absolutely fantastic! One of the best holidays I have ever been on. We had a fantastic and competent guide and the support staff were very personable as well. The itinerary was varied which was fantastic and there were a number of nice surprises like visiting the underwater cave, the aqua hiking which provided much hilarity as we had never heard or experienced such a thing. Loved the pace of the trip, loved the country, loved the staff, and the other members of the group. Special mention also goes to my driver who took us to visit his home which was very special. Top marks!